Harry and Shirley Amen knew about The Landing years before moving in. “We watched it being built actually,” said Harry. The Amens have lived at The Landing for almost two years now but they’re no strangers to the Lincoln community. “We’re Lincoln natives. We grew up in the same neighborhood,” said Shirley. That’s how the two met. Harry’s grandparents and Shirley’s grandparents were from the same village in Russia. 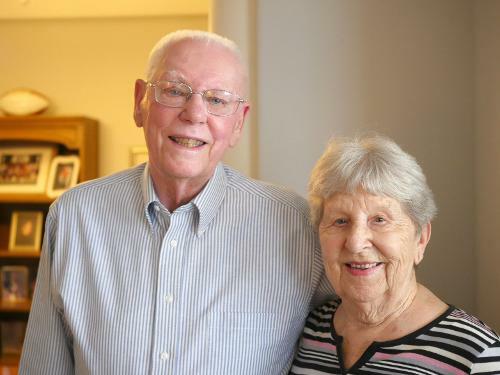 Shirley attended Lincoln General School of Nursing and Harry attended college for two years before enlisting in the Air Force during the Korean War. Harry left the Air Force in 1953 and became a chief clerk at Linweld in Lincoln, selling industrial, medical and specialty gases. He spent 40 years at Linweld before retiring in 1994. Shirley worked as a nurse for Lincoln General Hospital for 16 years and spent 9 years working at St. Elizabeth’s Regional Medical Center in Lincoln.